You might remember my blog post about the Carrefour Bloc-notes. 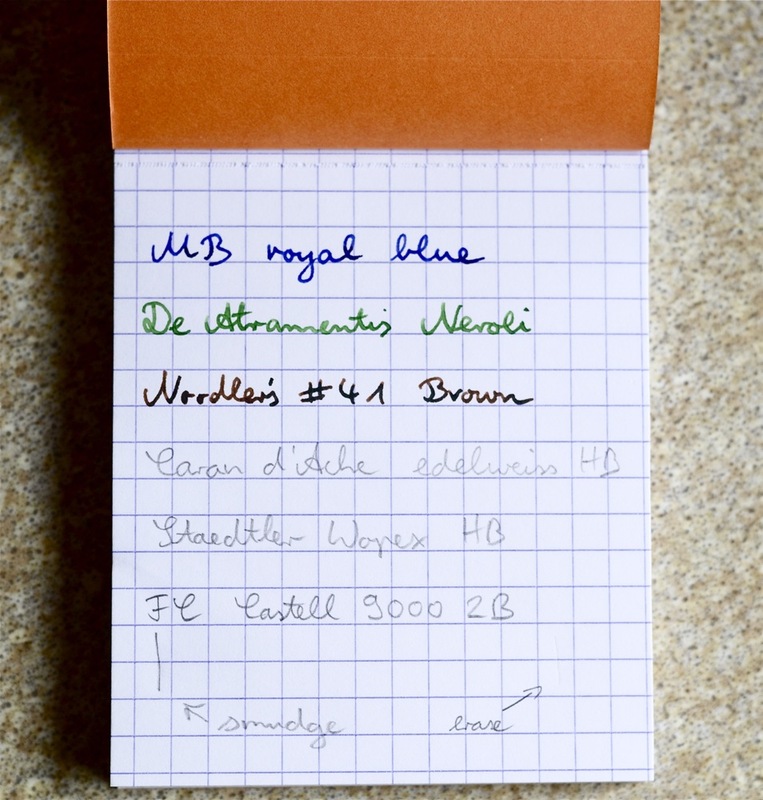 Today I want to talk about another Rhodia-style notepad, the Oxford Bloc1. I bought this notepad for €1.05 (~ $1.39; £0.85) at J. A. Hofmann Nachfolger in Würzburg, Germany. I haven’t seen it in any other brick and mortar shop yet, but I have seen several online shops that sell this notepad. Despite the British-sounding name Oxford belongs to Groupe Hamelin, a French manufacturer of paper and stationery with roots that go back to 1864 and with plants in nine countries. Just like the Rhodia and the Carrefour notepads this notepad is made in France and just like the Rhodia and the Carrfour notepad, the Oxford notepad is held together by a staple, too, and features a orange fold-around cover. The notepad is available in the same common formats – the one on the photo is the 74 x 105mm version. The paper feels less yellow and more purple than the Rhodia paper and less grey than the Carrefour paper. The grid printed on the paper is similar to the one on Rhodia paper, much less blurry than the Carrefour grid. The paper feels very smooth – no wonder the name of the paper has satiné in it. It is a fantastic paper for fountain pens and ink, the inks I tried don’t show through on the reverse side at all, even though one of the nibs was rather wet. For pencils it is a different matter though. The paper is so smooth that the graphite from the point of the pencil doesn’t seem to want to stick to it as much as on most other paper. As a result the line from the pencil feels slightly lighter than on other paper. Lines also feel lighter than on the previously discussed Oxford Black n’ Red polynote notepad. Both Oxford products use Optik Paper, but the Black n’ Red’s paper has a density of 90 g/m², compared to the orange notepad’s 80 g/m². Just as with the Black n’ Red it is also easy to erase graphite from the Rhodia-style notepad’s paper, but there is a chance that you will still be able to see the indentation where the pencil line used to be. As mentioned in the Black n’ Red blog post Hamelin / Oxford doesn’t react to query sent through their web site’s “Contact Us” form, therefore I’m unable to provide more information about the Optik Paper used. Where did you buy your Noodler’s ink in Germany? 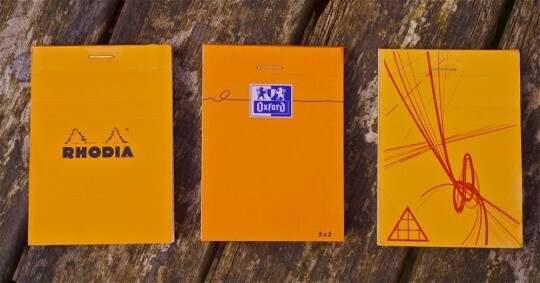 I have been looking for alternatives to Rhodia for some time, and I am glad to say that there are other viable options! Sadly, those options are not as widely distributed as Rhodia, so I guess I will need to keep looking. The Oxford Pad can definitely pass as Rhodia, if one does not look carefully, and it looks like it holds fountain pen ink quite well too. Good find! Thanks for this review, especially for showing the 3 notepads in comparison. The MB Royal Blue looks very nice on that paper. I wonder whether or not the choice of cover color is a deliberate effort to market itself as a Rhodia alternative. Is Oxford a popular brand in Europe? Sounds like it deserves more popularity. Emilio, I bought this ink from an American eBay Seller. Shanching, I was looking for the Carrefour notepads in different Chinese Carrfours, but was not successful so far. 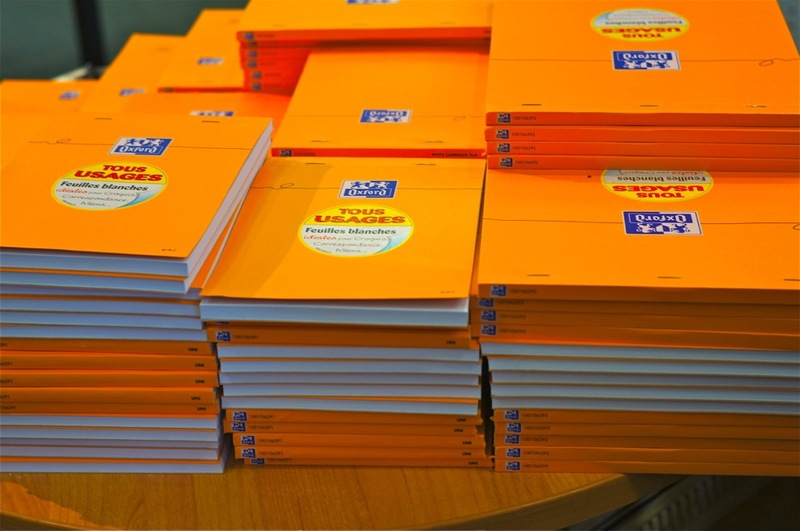 I also haven’t seen these Oxford notepads in any other shops yet – only online. I hope you’ll find a good alternative. Is there a specific reason why you are looking for an alternative? Sean, it is a very nice ink, but I haven’t noticed any advantage over royal blue ink by other manufacturers. Claire, I do think these manufacturers pick orange to look like a Rhodia notepad and so that the customer knows that this is supposed to replace a Rhodia notepad. If they were blue I’d think it’s because they are French (Allez les Bleus) or if they were Dutch (Oranje boven) I’d understand, too, but like this I assume they just copy Rhodia. Oxford is very common in the UK. It hasn’t been that common in Germany in the past, but like another French stationery brand, Maped, is has become much more common in recent years. Their products are available in North America, too, even though the brand name used might be different: OfficeSupplyGeek has reviewed one of their notebooks. 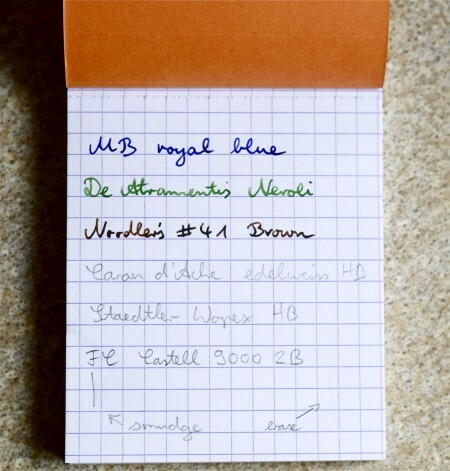 I am more curious as to whether there are paper that can withstand fountain pen inks as well as Rhodia, and so far, there are some viable options, but not as great as Rhodia. Miquelrius and Fabriano are among the few I tried out recently. It shall be a fun adventure with many experiments!